Well hallo there! I promised I would be back before Christmas and by Jove, here I am! Thanks to everyone who commented on my last post – I have got some really wonderful feedback to go into the next year of plans and dreams. Rest assured though, that nothing is really going to change much. Only the layout and hopefully, the frequency of posting. Anyway, to get back into the swing of it, I am going to do my best to do a ’12 Days of Christmas Outfits series’, to encourage me to wear something different for each of those days. As opposed to, say, the same trousers for four days’ running, just with different tops, as I am often found to do. Nothing wrong with that, of course. Just not what you want on a fashion/lifestyle blog, innit. I will however, be sticking to my annual Christmas tradition which is known as ‘Not Going On The Internet At All For A Full 48 Hours’, so I’ll do a bumper Christmas Day and Boxing Day post on the 27th. Do be aware that some of these outfits may be snapped on an inferior *cough iPhone* camera. And since I might as well start as I mean to go on, here is my outfit from today! This is me performing my other yearly Christmas tradition of working in my best friend’s shop on Christmas eve – selling almost any gadget you could possibly want for the kitchen. It’s called The Kitchen Shop… catchy, eh? 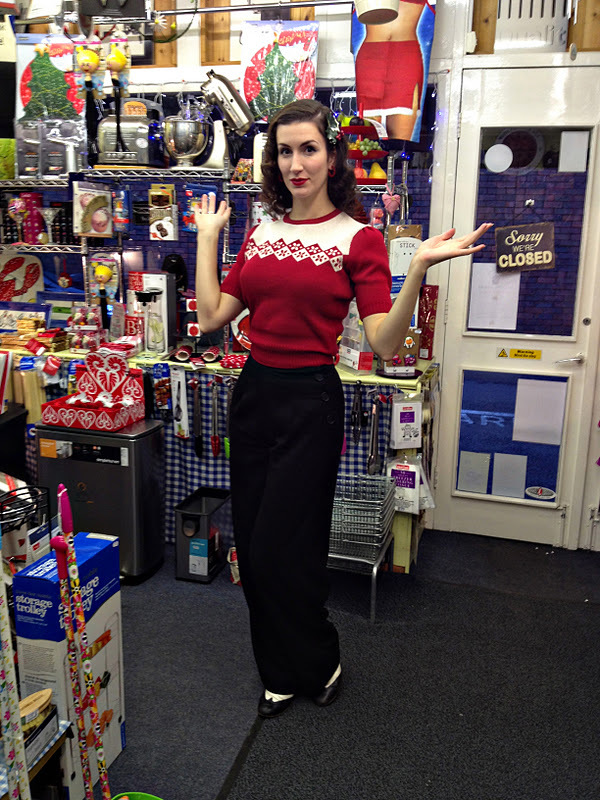 I couldn’t EVEN be bothered to put on stockings today, so it’s Heyday trousers which I have had for literal years, and a very festive jumper (sweater) which was courtesy of Rocket Originals (I modelled it for them back in the summer). My shoes are super oldies that I picked up one year at Rhythm Riot and have been resoled several times. 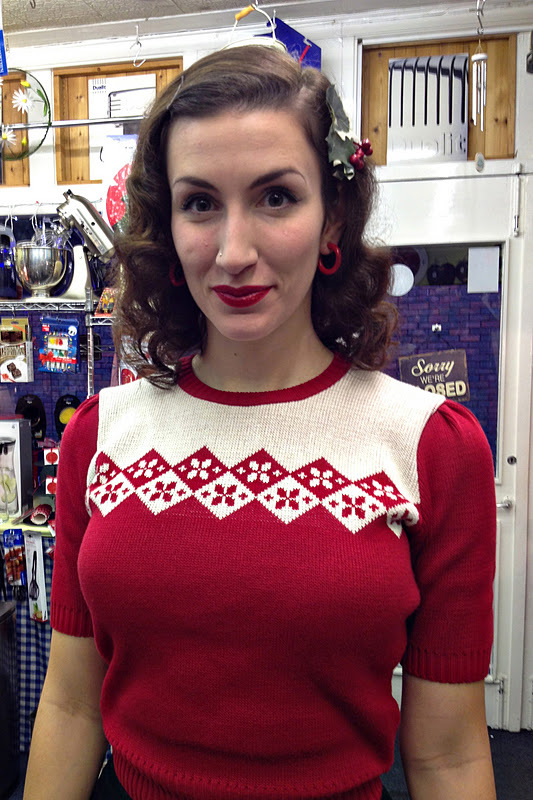 Holly in the hair, and some red plastic clippy hoops (not bakelite). Now if only Santa could bring me some thicker hair, that would be great, thanks. I also did some Christmas nails last night! 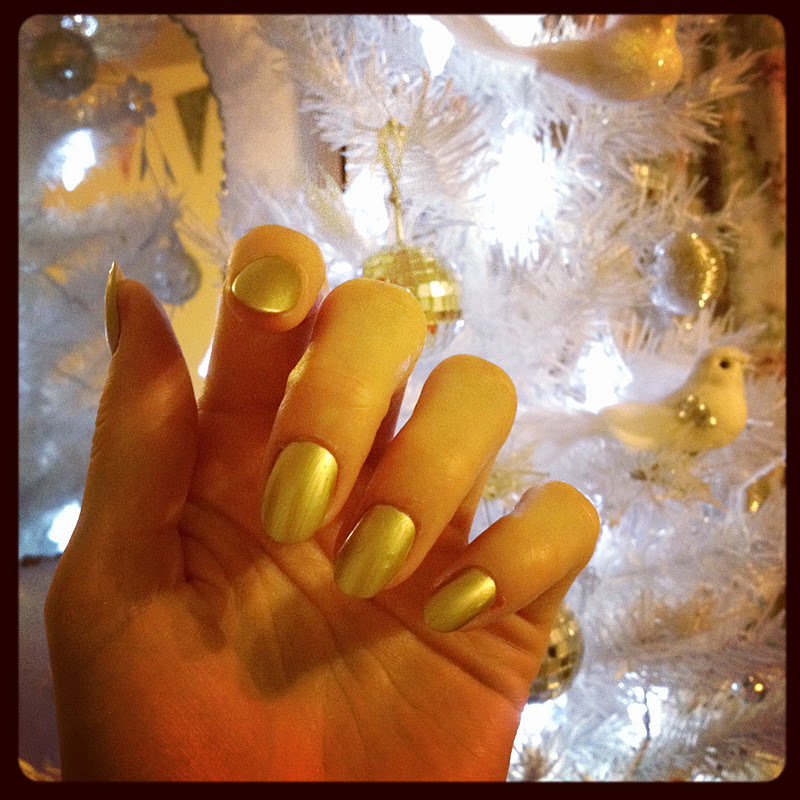 Barry M Instant Nail Effects in Gold Foil on what are, I confess, false nails. Mine are in an atrocious state! Anyway, I better nip off and load the car with outfits, presents and foods for the next two days. Be good while I’m away, won’t you! Hope you all have absolutely smashing Christmases, eat, drink and be merry, watch crap telly, keep warm (or, if you’re in the southern hemisphere, wear plenty of sunscreen!) and enjoy yourselves. Catch you on the flip side! Merry Christmas lovely! I am looking forward to the 12 days outfit posts…especially as I will be spending the holidays on line, since most of the people in my life are rather far, once again le sigh. To a better year in 2012! Love this whole outfit, including your gold nails. Happy holidays, beautiful Fleur!! I'm very envious of your jumper! Had my eye on that one for ages! Love the outfit – and the 12 days of Christmas outfits are something I can't wait to see! 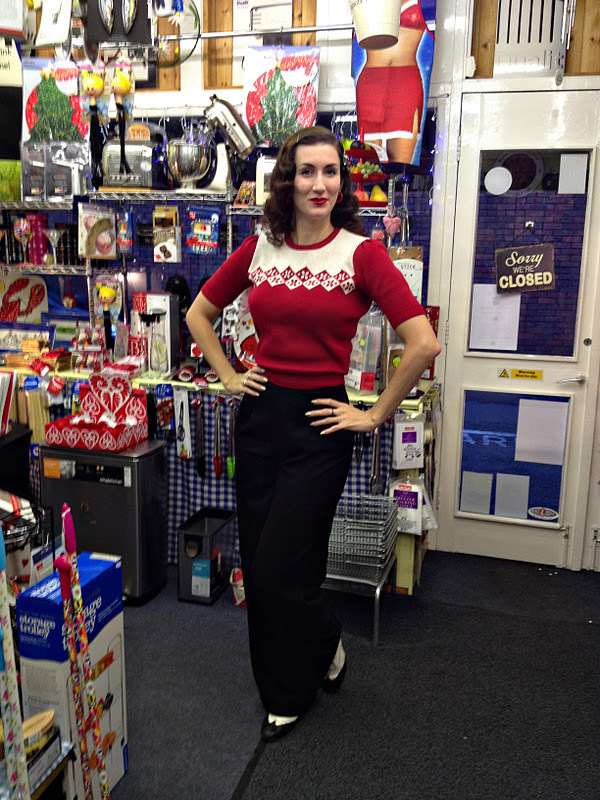 Lovely sweater and trousers combo! Christmas wouldn't be the same without a seasonal pullover or two.